When Karl MacPhee suffered his first seizure in 1997 during a military deployment in Bosnia he was immediately sent home. His life as a soldier cut short, MacPhee felt had he had no purpose. The transition to civilian life can be painful, he said. Many veterans never find inner peace. "The loss of identity when we can't serve, when we can't do our jobs, that's huge," MacPhee said in an interview Monday with CBC Radio's Edmonton AM. "That's what I experienced. "Watching from the sidelines is difficult, and I think that's one of the things that adds to the burden that we as veterans and first responders carry. "We're so dedicated to service and serving, and mission-oriented. When we're pulled away from that, it's a very big blow." Now a life coach and fitness trainer, MacPhee meets with fellow veterans to do something each year for Remembrance Day that doesn't involve traditional ceremonies. 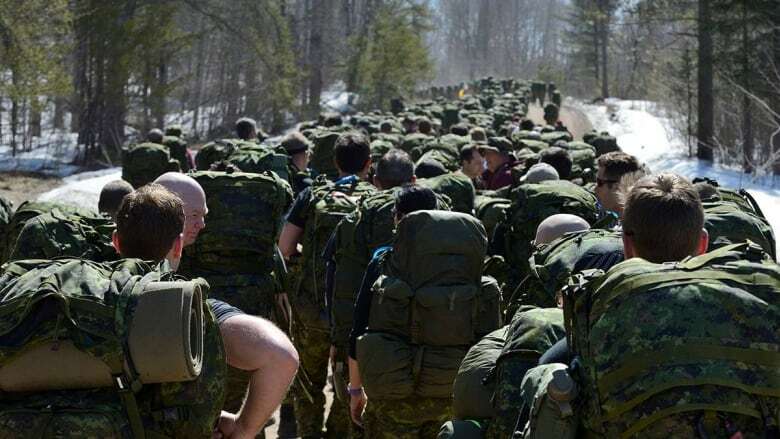 The Rucksack March for Remembrance takes participants on a 22-kilometre hike through the river valley to raise money for suicide prevention. "This is my new mission,"MacPhee said. "It has brought me a lot of joy, bringing these communities together. This is my new uniform, so to speak." The event was founded by MacPhee and fellow veteran Ian Hall. They met in 1996, in Wainwright, Alta., as military recruits. They came from opposite ends of the country — Cape Breton Island and B.C. — but found themselves thrown together as training began. Over the years, they lost touch after leaving the military. But two years ago, personal tragedy brought them back together. "A friend of ours — he was actually one our instructors while we were going through training in the infantry — he committed suicide and we realized we had to do something," MacPhee said. "He was jolly. He was so happy. No one expected this to happen, and when it did happen it was a blow to us. It was one more suicide that we had to deal with, that we had to talk about." On Nov. 3, MacPhee and Hall will lead the march from Gold Bar Park to Forest Heights Park and back, a trek that typically lasts around five hours. During the inaugural event in 2017 they raised $6,000 for Wounded Warriors Canada, a charity that runs programs and services for veterans and their families. This year, they hope to raise at least $10,000. The hike is physically demanding but the event is not about athleticism, MacPhee said. It's about encouraging the conversation around mental health and building a support network for those who are struggling. "Last year, stories from civilian to civilian, from paramedic to firefighter to veteran ... the stories were great and it was nice for people to share along the way." "It's not a race. We are starting together and staying together."